Cosmetic surgery procedures such as breast augmentation, mastopexy, liposuction, rhinoplasty, face lift and many more are available. Non-Surgical Aesthetic Services are available including dermabrasion, chemical peels, botox facial filler injections, laser treatments, and custom formulated skin care products. Aisthetikos offers Reconstructive Surgery for developmental abnormalities, injury, cancer treatment or other acquired defects, for all areas of the body. Aisthetikos performs comprehensive wound care at various facilities throughout California and is an educator on wound prevention. We believe that when influencing form, it is imperative to unify this physical change with a positive psychological impact. We strive to create not only physical beauty but restore wholeness and balance. 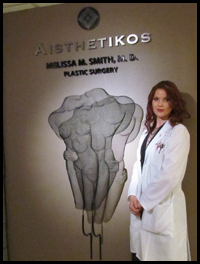 Our approach can best be defined by the word Aisthetikos: Greek for aesthetics, means “sensitivity” or “of sense perception” and in Greek philosophy deals with the form and the psychological effects of beauty.